I just finished reading this essay from C.S. Lewis entitled The Four Loves. Angelsportion loyalists will know that I am a fan of Lewis, and being that the loyalists and I have traveled together as friends for so long now, these words came to mind and seemed appropriate. They seemed appropriate because Angelsportion – a peculiar trinity of whisky, poetry, and theology – has dubbed me as ever-so-privileged to meet so many interesting people from all over the world, many of which I now call “friends.” This happened as some (and you know who you are) have actually reached out for quality conversation in a plane above that of digital avatars and creative screen names. Others have, in turn, been receptive to the handshake I have sought to initiate. Every so often, this is my joy by phone. Every so often, this is my joy in person. Additionally, any milestone, great or small, is in my estimation an opportunity to celebrate with the experiencing of a brand new edition. In light of this particular post’s beginning, know that the following review of Black Bottle first celebrated the event by beginning with a raised glass, and a toast to my friends (especially the one who gave it to me today as a gift). The toast took the form of a humble petition that the Lord would grant for you, according to His gracious will, to be steadfast in faith, stout in love and family, joyful in your avocation, and never thirsty. And I know He listens to me. Now, don’t freak out. Yes, I know, a blend is not my typical dram; even more so a peaty, smoky blend is typically a sojourner in my region of the kingdom most often governed by the likes of The Balvenie and such, and yet, since we are seeking to kindle new flames and I trust the one who gifted it, I have proceeded to write this review. I’m glad I did. 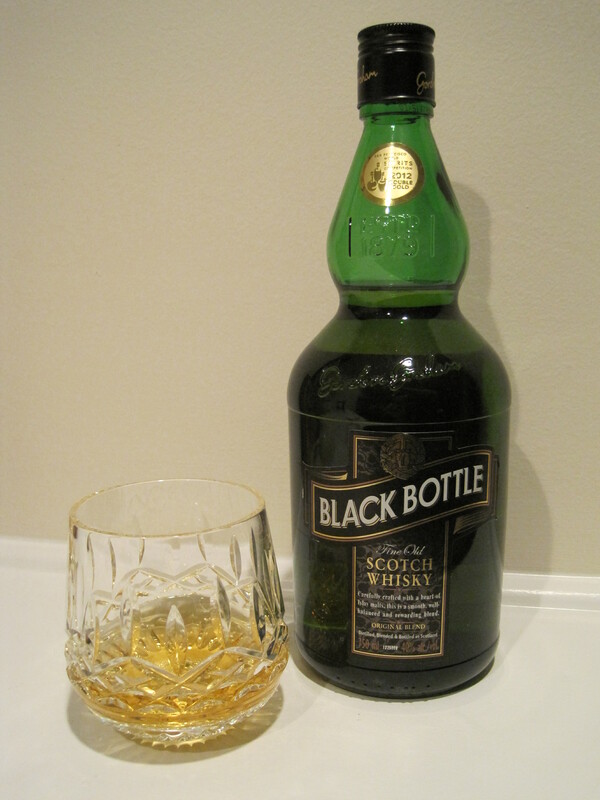 Reportedly, Black Bottle is a blended consortium of seven of the eight Islay distilleries: Ardbeg, Bowmore, Bunnahabhain, Bruichladdich, Caol Ila, Kilchoman, Lagavulin, and Laphroaig. I don’t know for sure which one is the orphan, but my guess is Kilchoman. I have neither evidence nor research except to say that I’ve consumed editions from each and every one of the above distilleries and this particular edition seemed far too good to have included the likes of Kilchoman. If anyone feels inclined to do the research to discover the truth, please feel free to contact me and let me know. The nose of this whisky greeted me at its gate with a hint of fruit and barely a hint of peat. I did catch a faint wafting of the smoke from the whisky still, as if it had rolled down some distance from a salty sea wind to reach me. The palate delivered some of that salty sea air befriended by something sugary — almost more relaxed and kind-hearted than I expected. This is to say that since we are speaking in terms of “friends,” I expected this particular edition to be my “rugby” friends. This came at me more as friends who used to play rugby, but now they play chess and speak of philosophy. It is more sophisticated. The finish is in alignment with the palate. It is a long, warm embrace, one that signals that we needn’t feel as though we must finish the match tonight, that we needn’t feel as though one or the other must announce “checkmate” before parting ways. It simply fades away with its fragile peat smoke into the truth that the hour is late and even the bishops and knights and pawns have grown tired. Behold, friends must part ways for a little while. I don’t normally recommend blends, as you my friends, would know. Even more traumatizing, when I discovered the price, it was somewhat of a shocking “Tomatin 12″ moment for me. Finally, if you can actually find a proprietor who carries this bottle (mine was delivered to me from Chicago), I am willing to admit that it would be money well spent. And with that, thanks, Doc. I owe you one, my friend. Great post. But I believe that Ardbeg is included but Kilchoman is not. We need to research that. But overall a great tribute to a unique & superb blend. I have tried Islay Mist….costs more but not half as good….. Slainte !! Thanks, Doc. I’ll check into it. You do the same. Let me know what you find. Slainte! !